Suppose you want to show a photo on your android phone to a friend. So you open the photo and hand it over. Almost all of us end up staring at the phone to see what he is doing. Deep inside, we just want to make sure he doesn't wander and look at any thing else on the phone. And this sudden privacy consciousness puts all of us a bit uneasy for that short period. Share selected pictures while restricting or hiding others. 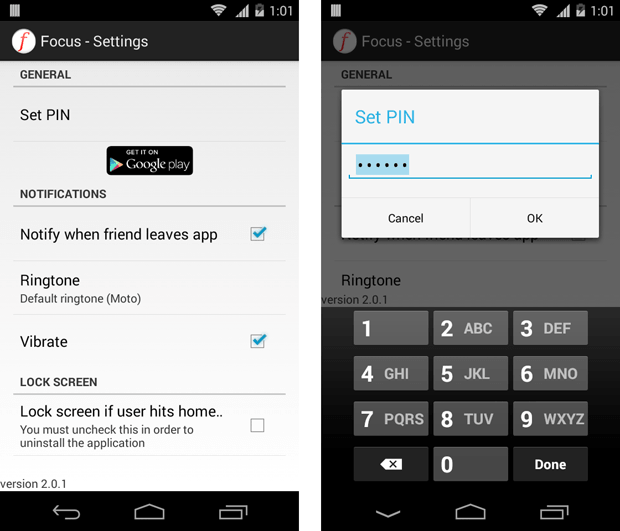 So here's a simple android app "Focus - Photo Sharing" that lets you show only selected pictures to anybody. After you install the app, you need to configure it first to set a pin number. Now open the Gallery app on your android phone. You would notice that a new button is added on top of the Gallery app with the same icon as the "Focus" app. Select the photos you want to show to your friend and click on this button. Imp: If you use any other photo viewer app like Google+ photos, Quickpic etc or just don't see the new button, just use the share button and select the "Focus Gallery Share" option. That's it, the photos will now open and you can confidently give the phone to your friend. He will be able to view only those photos you have shared by swiping left or right. Other options like zooming, auto rotate etc will be available as well. If he clicks on the back button, a warning message will appear requesting to return the phone to the owner. Once you get the phone back, you can enter the pin to exit the photo viewer. Once caveat - If your friend presses the home button, the app will exit and go to your phone's home screen though. A small alarm will also sound as an alert. If you want more security and block the home button as well, just enable the "Lock screen if user hits home" option in the settings page of the Focus app. With this, your phone will lock itself if the home button is pressed. Pretty nice and easy solution ain't it? Want to show some photos to your friend, but don't want to hand over the phone in case he keeps swiping? Here's the perfect solution for your android phone.